If you’re dreaming of a rustic wedding, a barn venue could make for the perfect setting! The Barrie – Muskoka – Collingwood region boasts some of the most amazing barn wedding venues in the province. When planning for the perfect barn wedding photos, I recommend starting with your ceremony – aim for shady locations under a large tree. This keep your guests cool and create the most flattering light for your photos. Other location ideas could be the shady side of the barn which has the bonus feature of the barn board texture as your ceremony backdrop. Naturally beautiful landscapes inherent with farms offer a relaxing atmosphere for outdoor cocktails, lawn games and your first dance under the stars. Once you move into the nearby barn for dinner, you can wow your guests with all the rustic charm of a venue with exposed beams and raw textures. Many of the barn venues I’ve listed below offer amazing accessories such as chandeliers, authentically rustic farm props and luxury dining chairs to set the ideal vibe. When it comes to creative photos with my couples, I often play it simple and let the property speak for itself. Imagine a slow stroll down a country road or dragging a cooler with your bridal party out into a big open field. I’ve had some of my favourite shoots at barn wedding venues around these parts. The Belcroft offers two beautiful venues for wedding ceremonies and receptions. . The rustic century barn is charming with classic barn features as well as modern amenities. The beautiful marquee tent is an alternate option for a more outdoorsy garden type wedding. Both venues are gorgeous backdrops for your wedding celebration. 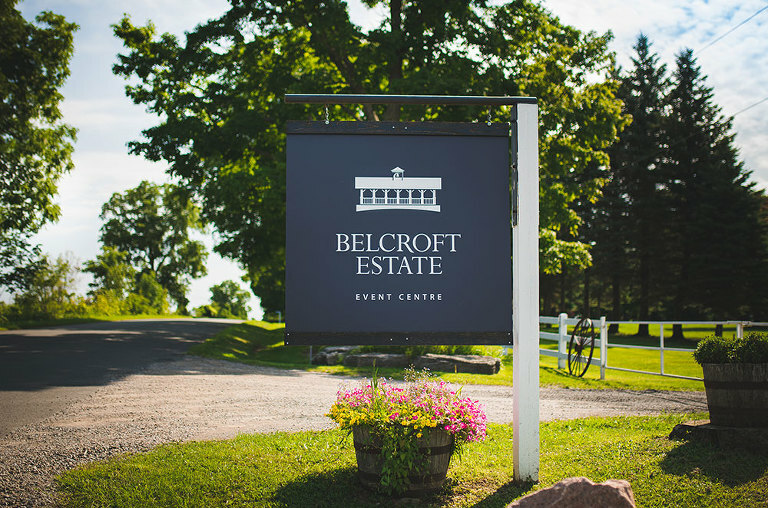 Belcroft Estates features multiple bridal suites options and the famous Man Cave groom quarters. 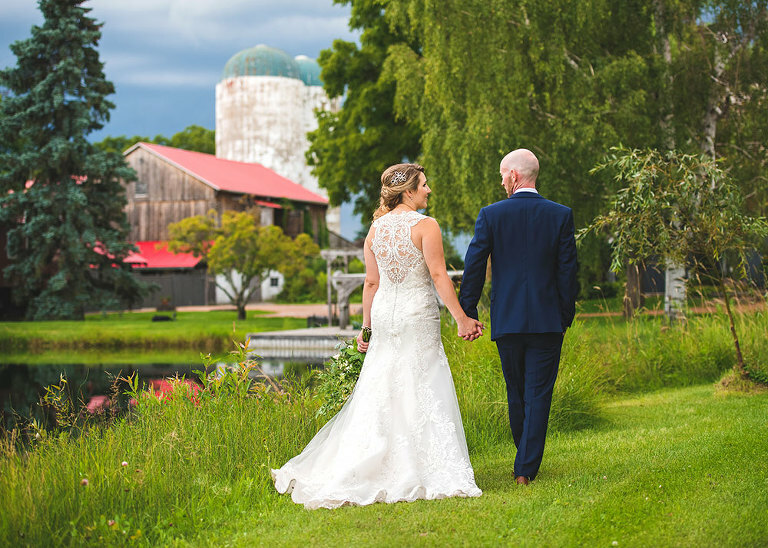 The venue boasts a lovely tree-lined, country laneway, a pond complete with a covered bridge and a field that provides a great view of the sunset. The Barn’s capacity is 110-160 guests and the Marquee Tent capacity is for 110-250 guests. Belcroft Estates is also a nice one-stop option offering services that include DJ, catering, and is a licensed AGCO facility. You have enough decisions to make while planning, having these vendors already in place makes the Belcroft a hassle-free venue. Waterstone Estates is set on an equestrian backdrop with a beautiful century bank barn on top of 100 acres of stunning rolling hills. Right from the moment you drive up the lane way you get the immediate barn wedding vibe. There are three terraced outdoor ceremony sites to choose from, as well as their classic hilltop barn. You have exclusive use of the outdoor and barn wedding venue as well as Waterstone’s Grand Room with soaring cathedral ceilings for your reception. They have capacity for 150 people. The also have the Hunt Lounge bar just off the main Grand Room for you and your guests to enjoy exclusively. On-site wedding co-ordinator and wait staff are always available make sure everything runs smoothly. You can even arrive to your wedding ceremony on a horse & carriage in classic farm wedding style! There isn’t a physical barn on site however Northbrook Farm is a 10 acre farm full of natural beauty located in Severn just outside Orillia, Ontario. It boasts strikingly beaufitul gardens, trees and the famous pond making this a rustic fairytale farm wedding venue. Their large permanent frame tent tent is 40′ x 75′ is super bright and can seat up to 160 people. The tent is lit with chandeliers and fairy lights drapery. Amenities include portable washrooms under one roof as well as a catering tent complete with commercial fridge and prep tables. There’s also a beautiful bridal suite inside the home if you wish to get ready on site. Contact Laurie and Chris for a site visit. Paradise Acres Barn Wedding Venue setup.